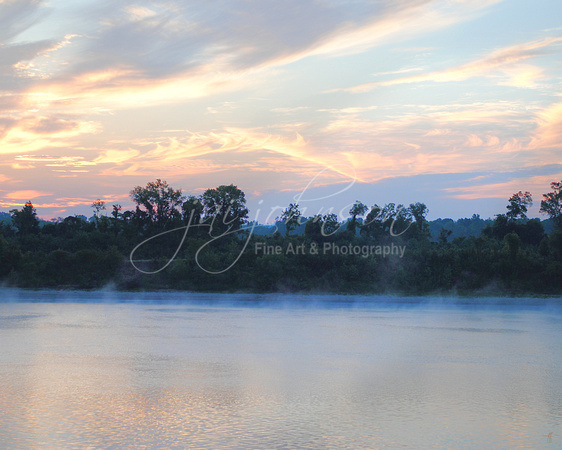 This gorgeous water scene features blue and yellow hues as the sun and fog rises over the Tennessee River in Shiloh, TN. It's the perfect wall art and decor addition for those who enjoy cool, water landscapes. All products require 2-3 business days for manufacturing and a week to ten days for shipping to your location. Economy shipping is included in all pricing. Please contact our studio if you have any questions about your order. All products are each personally inspected by the artist and are shipped direct from our studio in Jackson, Tennessee. Our art greeting cards printed on bright white, smooth card stock with a matte finish and are a truly elegant way to offer a beautiful, artistic, handwritten greeting to someone special. Each card is blank on the inside and includes a soft white, European fold envelope for mailing. Being a standard size 5"x 7", each card is suitable for matting and framing in any standard frame on the market. Matte Finish Canvas | Thin Mounted Wrap | This size canvas print is mounted around .75 inch thick (depth) stretcher bars and the image wraps around the sides with a fraction of an inch around the back. These can be hung in an open back frame or directly on the wall without a frame. This is our most popular option for gifts for birthdays, Christmas, general holidays, housewarming and wedding gifts. Matte Finish Canvas | Thick Mounted Wrap | This size canvas print is mounted around .1.50 inch thick (depth) stretcher bars and the image wraps around the sides with a fraction of an inch around the back. These can be hung in an open back frame or directly on the wall without a frame. Matte Finish Canvas | Thick Mounted Wrap | This size canvas print is mounted around .1.50 inch thick (depth) stretcher bars and the image wraps around the sides with a fraction of an inch around the back. These are usually hung directly on the wall without a frame. Limited editions (7) are printed on UltraSmooth Fine Art Paper (Epson Ultrasmooth Fine Art Paper) for a true true archival print media. The paper is an acid free, 100% cotton hot press paper. This cylinder mold-made product features an ultra smooth finish which is not only acid, lignin, and chlorine free, but it is also pH buffered with calcium carbonate for a true archival sheet. Editions feature 7 prints. Each print features approximately a 2" white border around the image and is ready for professional matting and framing. *Edition may be retired before all 7 prints are sold and when retired becomes unavailable for sale. *A sample, unframed signed and numbered limited edition print is shown below to give you perspective on size. Once print is matted and framed, it will encompass a larger area on the wall.